Alhambra, CA - On Jan 12-13, 2011, the members of the Secretariat of the Assembly of Canonical Orthodox Bishops of North and Central America met in Alhambra, CA at St. Steven’s Cathedral, hosted by His Grace Bishop Maxim. The meetings were led by His Grace Bishop Basil, and included bishops, priests, deacons, monastics, and laity. 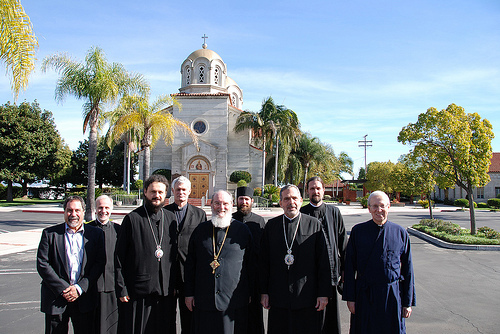 In addition to Bishop Basil, the others in attendance were: Bishop Andonios, Bishop Maxim, Fr. Mark Arey, Fr. Nicholas Ceko, Fr. Josiah Trenham, Protodeacon Peter Danilchick, Mr. Eric Namee, and Fr. Benedict Armitage. Mr. Alex Machaskee was able to participate by phone in part of the meeting. The Secretariat recommended to the Chairman, Archbishop Demetrios, some changes in the appointments for the committee members and chairs, which will eliminate the duplication of responsibilities and foster better efficiency. Bishop Andonios, as the Secretariat’s Coordinator for Agencies and Endorsed-Organizations, was charged with creating standards for endorsement by the Assembly, reviewing the current endorsements, and developing a process for deciding on new applicants. Mr. Constantin Ursache, who works closely with Bp. Andonios and Fr. Mark Arey, was appointed a consultant to the Secretariat. Bishop Maxim, as Coordinator for Committees, intends to contact the chairmen of the thirteen committees (refer to Committees tab) soon, to help them begin in earnest their work on behalf of the Assembly. Protodeacon Peter Danilchick, who developed a protocol to help the committees, was appointed consultant to Bishop Maxim. The question of communications was also discussed. Those present acknowledged the fact that the Orthodox faith is not well-known to the media and public, and that heretofore has been largely unable to speak with a unified voice. It was asked, if Orthodox Christians neglect to address important issues in society, how can they be upset when their political leaders do the same? As a result, the Secretariat has proposed, for the Chairman’s consideration, the creation of an Office of Communications. It will be empowered to speak on behalf of the Assembly, especially at times of crisis, when quick action is required. It is imperative that any message issued by the Assembly represent the views of all the member bishops; thus, the bishops themselves must determine at their next meeting in May how this process should work. Mr. Alex Machaskee agreed to act as a consultant to the Secretariat for communications. Also discussed was the question of fundraising and the means of funding the activity of the Assembly, its Secretariat, and the thirteen committees. It was unanimously agreed that financial transparency and accountability was of the utmost importance. Various other items of business were also discussed. The meeting was a very successful one, for which we thank God. This success was the result of the expertise, good will and dedication of all those present, and was also due in no small part to the warm hospitality shown by Bishop Maxim, Fr. Nicholas Ceko, the Hieromonk Jovan and the Cathedral’s Circle of Serbian Sisters – to whom many thanks are due.